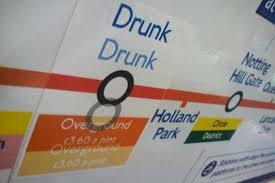 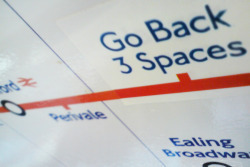 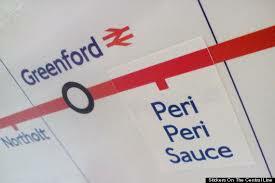 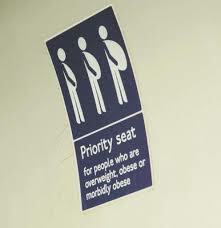 Since April 2011 there has been numerous high-quality stickers and labels appearing on trains using London’s Central Line on the Tube. 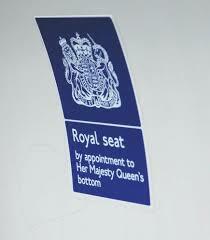 They are humorous and satirical in nature and range from the sublime to the ridiculous! From parodies of social media and the royal family to references about world banking, overcrowding on the tube and times of the year, these labels have intrigued and amused commuters whilst infuriating authorities as to how they got there and who is behind their mysterious appearance. 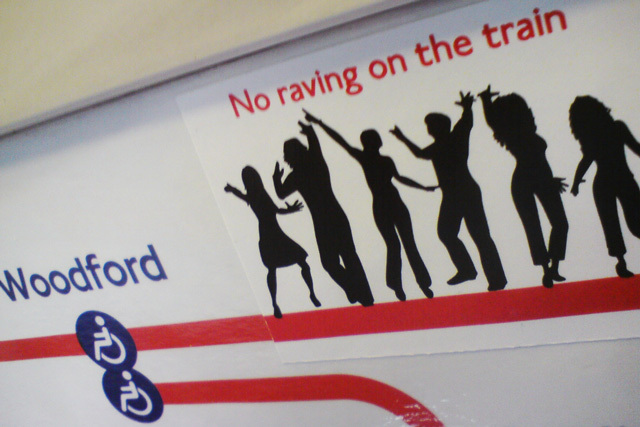 Whilst here at Sticky Labels, we do not condone slapping stickers all over the place for fun (It may be illegal!) 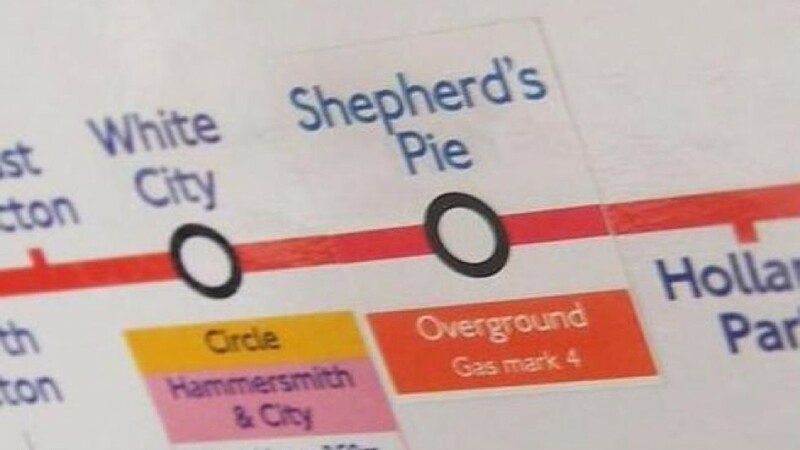 we do admire that these professionally produced stickers are in keeping with the existing design schemes, fonts and famous branding of the Tube as well as providing some excellent distraction for London Underground’s millions of commuters. 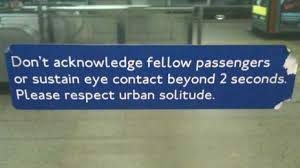 Whenever we’ve used the tube in the past we tend to switch off and rarely notice our surroundings so we can only imagine the drudgery of a daily Tube ride for those commuters who work in London on a daily basis. These labels would surely provide some respite from that boring ride and lack of interaction with others! 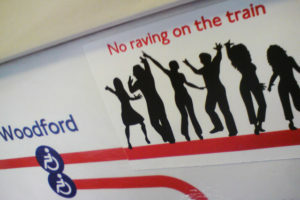 An ‘underground’ (Arf Arf) movement calling themselves ‘Stickers on The Central Line’ use various social media to display their “beautifying” of London’s underground and even takes requests and suggestions for future labels and stickers! 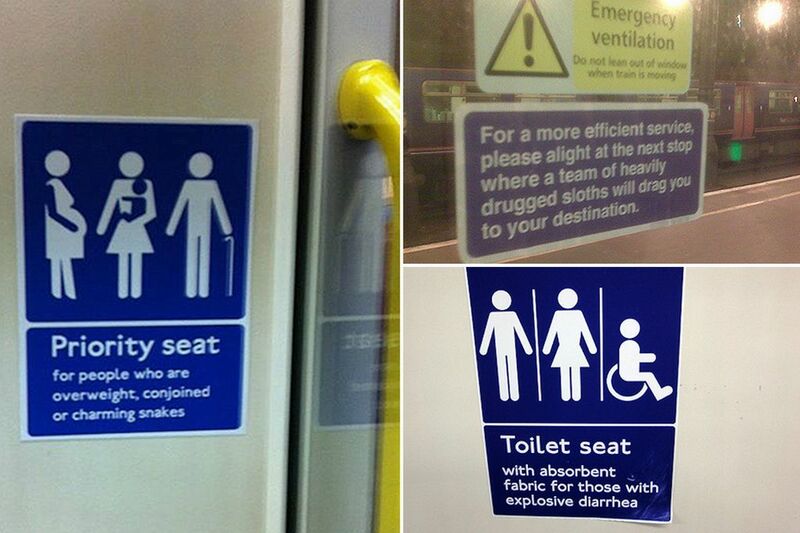 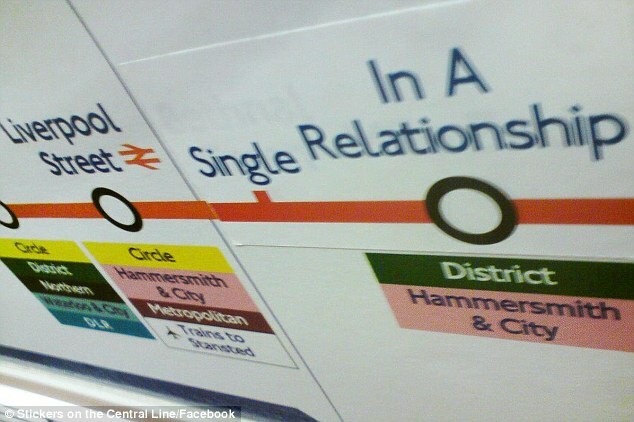 A Facebook and TUMBLR page for ‘Stickers on the central line’ can be found with a plethora of examples which use humour to often make a serious point such as overcrowding on the Tube itself, social etiquette for travellers and the rise of obesity but also celebrating times of years and ceremonies such as Halloween and Fireworks night! 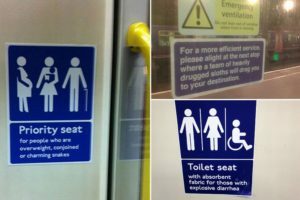 The Stickers have enjoyed coverage by The Guardian, The BBC, The Daily Mail, BBC, The Poke & The Huffington Post but not everyone is happy: The British Transport Police (BTP) have warned that this is classed as graffiti and is punishable as a criminal offence. 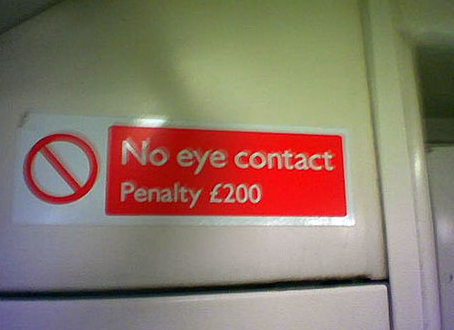 Banksy Behind the Stickers Plot? 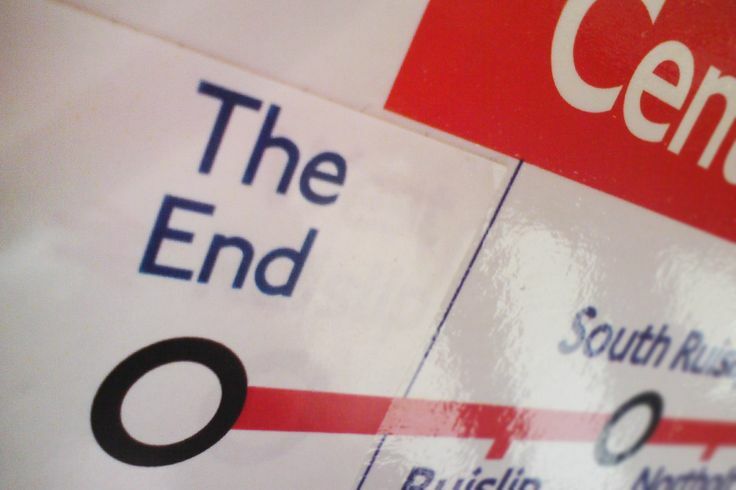 Some have likened the nature and style of humour to the famous graffiti artist Banksy who has been behind some of the most famous satirical ‘art’ around the world. 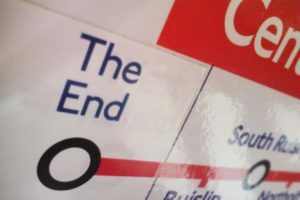 Spreading from the streets of Bristol to London, New York and the Palestinian Wall in Israel, his reach is wide and he is known for trying new variations in the graffiti world whilst always maintaining humour with an underlying central message. 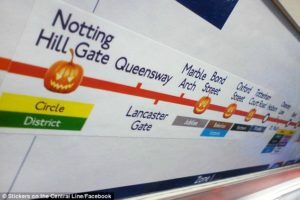 No one is 100% sure who is truly behind the stickers random appearance on the Central line but as with all mysteries is capturing the imagination makes for a good story… as many of the people who have shared the story on Social Media will agree. We’ll be uploading this story to our own Sticky Labels Facebook Page and @stickylabelscom Twitter Page!